New Adventures in Odyssey albums just keep stacking up (which we’re okay with!). Although Album 63 isn’t available on CD, digital download, or through AIO Club access, we thought we’d share what’s coming up beyond the next release. Get ready for Album 64: Under the Surface. 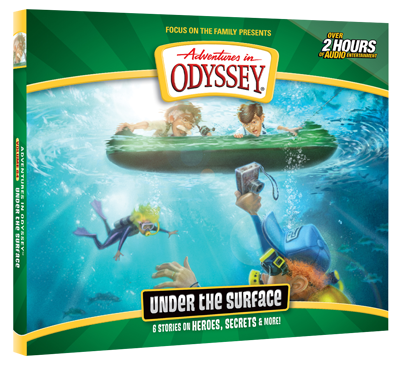 The cover art for the album has surfaced online and features Whit, Eugene, Wooton, and Penny on an exciting underwater adventure… in Odyssey? Album 64 will be available on CD in April 2018, with AIO Club access and digital download before that. Be sure to stay tuned in the days ahead as more information becomes available. You can follow information on Album 64 here, and be sure to follow our blog. For now, keep watching the blog each day as we’ll be focusing in on Album 63! You never know what Adventures in Odyssey news lies just around the corner!